It is a sad but true fact that many elderly people are forced to leave their homes when they can no longer live independently. Assisted living communities can cost thousands of dollars a month and cause a burden financially on them and their families. Many elderly people are forced to leave their homes before they want to because they have limited mobility and can’t use the stairs to reach important areas of their home anymore. There is hope for elderly people facing this all too common scenario. So the problem stems from elderly people having trouble safely using the stairs in their homes. This can restrict them to the first level of their home and keep them away from important rooms like their bedroom or bathroom. Having a stair lift installed can eliminate this problem by providing a safe and convenient mode of travel for any elderly person. A stair lift will comfortably carry an elderly person up and down a set of stairs quickly and efficiently. By having transportation up and down the stairs, an elderly person will be able to take back their independence and have access to every room in their home. 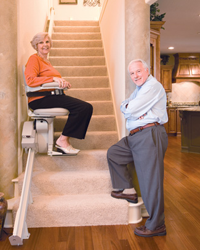 Stair lifts use a simple system that involves a track, chair, and re-chargeable battery. A straight or curved track, if there is a turn, is installed along the wall of the staircase. A chair is attached to the track that has arm rests, a foot rest, and seat belt. Some chairs will swivel when it is at rest for easy on and off access. The chair is powered by a rechargeable battery that connects to any standard outlet. The batteries take a charge whenever it is at rest, so the chair will still run even in a power outage. They have sensors that will stop the chair if there is anything that hinders its path. The chair rides smoothly up and down the stairs and can fold up tightly to the wall when not in use. A stair lift is a quality investment that costs far less than an assisted living facility and can allow an elderly person to continue living independently at home. There will be no area of the home that is not accessible when there is a stair lift installed.